Across two full-length albums including King Hokum in 2006 and 2008’s ARIA winning Jungle Blues, C.W. 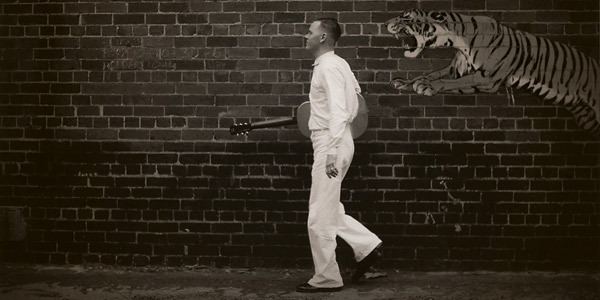 Stoneking has rightfully earned the reputation as the leading voice on the Australian roots music scene. Revisiting and re-invigorating the pre-war blues, jazz, calypso and jungle sounds of the 20’s and 30’s, C.W. Stoneking has captured the imagination of a nation with his plaintive nostalgic voice and vivid narrations. Accompanying himself with National Reso-Phonic guitar and tenor banjo, and with his amazing brass band the 'Primitive Horn Orchestra' Stoneking's songs range in style from lonesome field holler blues, to hokum blues duets, to full blown jungle epics. 2010 sees C.W Stoneking preparing to take his own special brand of blues and hokum to the world with tours planned in the UK and an invitation from Jack White to record a side in the U.S. for his Third Man imprint. On his return in late 2010 C.W. will put the finishing touches on his awaited third album which is sure to further cement Stoneking’s position at the forefront of Australian roots music.